Brain surgery during Harappan civilisation? Special Arrangement TECHNOLOGY TRANSFER? : Scholars have recorded striking similarities in trepanation techniques across the continents. Trepanation, a common means of surgery practised in prehistoric societies starting with the Stone Age, involved drilling or cutting through the skull vault, often to treat head injury or to remove bone splinters or blood clots caused by a blow to the head. While evidence of the practice has been found from regions in Peru, Europe and Bronze Age Jericho of Palestine, this is the first time the trepanation has been found in the Harappa civilisation. According to the research paper, a trepanated hole was found in a Harappan male skull that had been kept in the Palaeoanthropology Repository of the Anthropological Survey of India in Kolkata. It had been unearthed at ‘Cemetery H', which contained crude red ware but not typical Harappan ceramics. The procedure has, in some parts of the world, also been associated with religious rituals and “to ward off evil spirits”. 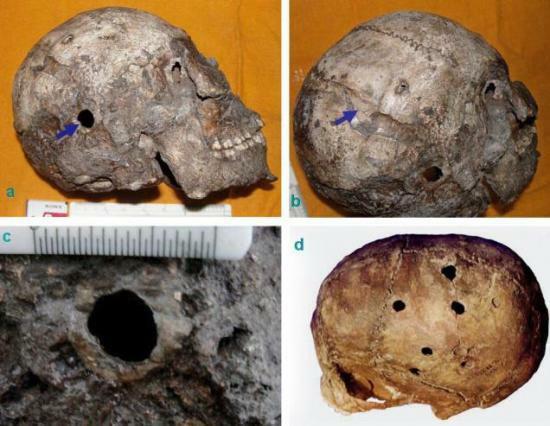 However, in the case of the Harappa skull, the trepanation was intended as therapeutic as there is a clear indication of cranial trauma in the form of a visible linear depression, probably resulting from a severe blow, says the study by A.R. Sankhyan and G.R. Schug. There is evidence too of healing, “indicating that the victim survived for a considerable time after the operation,” the paper adds. “Scholars have recorded striking similarities in trepanation techniques across the continents, and therefore consider it as important evidence for prehistoric movements of people and for transfer of surgical skills from one society to another,” the authors say.